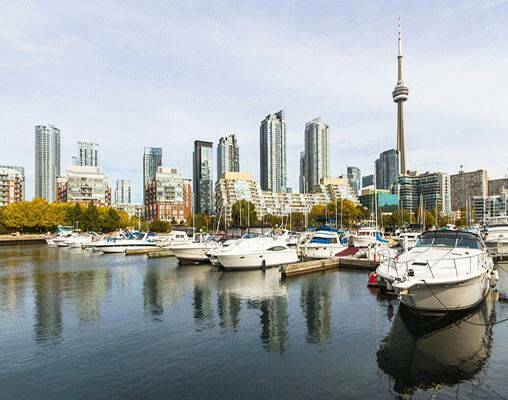 This 9-day journey takes you through the heart of Canada as you visit its biggest and best cities of Toronto, Ottawa, Montreal and Quebec City. Begin this tour of Canada's heartland as you depart Toronto for a daylong trip to the majestic Niagara Falls. Try to stay dry as you enjoy the views of thundering waterfalls before returning to Toronto to explore the thriving nightlife of this diverse city. 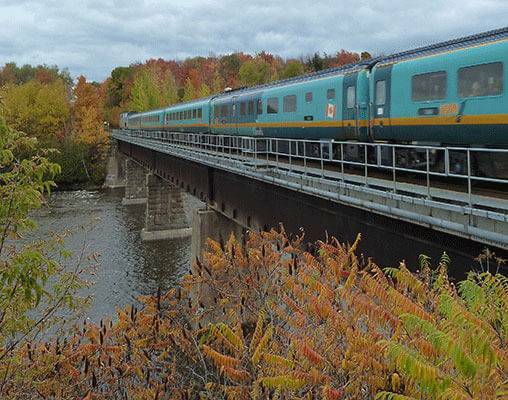 Start the train portion of your journey as you embark on VIA Rail's first-class accommodations toward Ottawa for a two-night stay. You'll have a morning tour to visit everything from the grand Parliament to the serene Rideau Falls*, then an afternoon to explore on your own. Return to your train to travel to Canada's cultural capital of Montreal, with its European flair and influence, for a two-night stay. 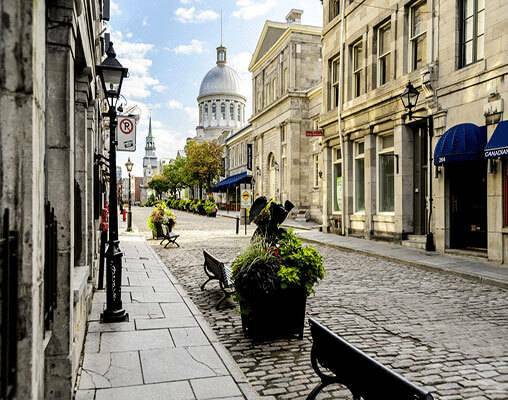 A morning sightseeing tour will take you to its best spots, including Old Montreal, with the afternoon free to eat, shop, and explore. You'll then depart Montreal and travel along the St. Lawrence River to Quebec City, the only walled city in all of North America. Watch the lovely sights fly by from the comfort of your luxury train. Once settled in Quebec City for your two-night stay, you have the choice to take a sightseeing tour, or explore the flavor of the city's old world charm and French culture on your own. This itinerary is also available from Quebec City to Toronto based on your travel preference. Arrive in Toronto and transfer to your hotel with the remainder of the day at your leisure. Overnight Toronto. 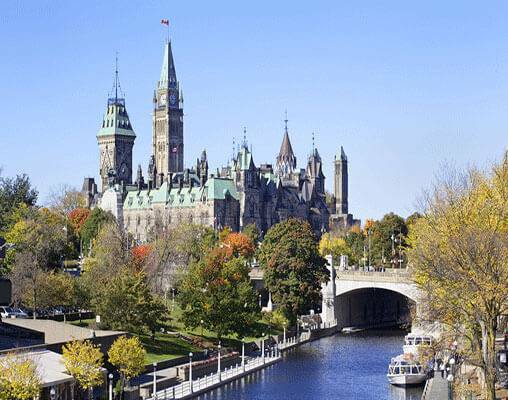 This morning, tour the nation's 'Capital' highlighted by Canada's Parliament Buildings, the Embassies, the Prime Minister's residence, Rideau Falls and Canal*. The remainder of the day is free to explore the National Arts Centre, take a stroll in one of the many parks, or return to further explore Canada's Parliament buildings (walking distance from hotel). Overnight Ottawa. Set off on a morning city tour of Montreal, the second largest French-speaking city in the world. 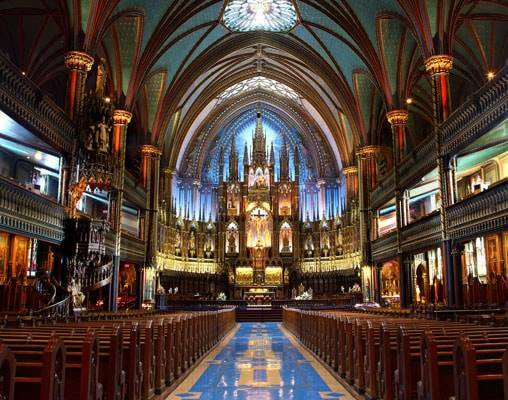 Visit Old Montreal, Notre Dame Basilica, Olympic Park, and Mount Royal Park. View Montreal Harbour on the great St. Lawrence River - 1000 miles from the sea. The afternoon is free to shop and explore. Overnight Montreal. 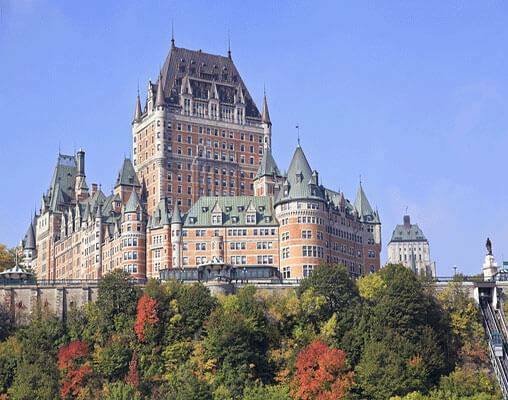 Today's rail travel from Montreal follows the St. Lawrence River to the "Ancient Capital," Quebec City. The only walled city in North America, Quebec City, boasts "old world" charm. Overnight Quebec City. Today is yours to experience the charm of Quebec City, the cradle of French culture in North America. Enjoy sidewalk cafes and outdoor displays by Quebec artists, all set among 400 years of history. A small group guided walking tour of Old Quebec immerses you in the history of the walled city and allows you to explore the hub that is Quebec City. Overnight Quebec City. Hotels included are Chelsea Hotel, Toronto, Lord Elgin Hotel, Ottawa, Delta Montreal and Hotel Manoir Victoria, Quebec City. Business class rail aboard the train is reserved for the exclusive use of Business and Sleeper Plus class travelers, all our Business lounges are equipped for your comfort. Enjoy the services of dedicated personnel to help you with your travels, spacious seats, HD television screens, free non-alcoholic beverages and Wi-Fi. VIA rail’s renovated car has a 2-1 seats configuration: more space for every traveler thanks to a row of single seats. It also has new ergonomic seats, side table and an electrical outlet available for each seat. Meals and a cocktail service are also included. Click here to view testimonials for Maple Explorer. Enjoyed the comfort and service on the trains. All the accommodation was clean and comfortable, and some was very nice. All the excursions were interesting. Amazing trip, loved exploring these cities and great to relax and get away from normal life. Enter your details below if you would like to be notified when 2021 dates and prices are available for Maple Explorer. Hotel and Rail accommodations listed above, are subject to change based on availability at the time of booking. *When day tours or attractions are not operational in the off-season, the price will be adjusted or there will an alternative excursion/attraction made available. Ask your rail specialist for details. Prices are per person, based on double occupancy. Taxes are not included on rail portions and are subject to change. Child prices are available upon request. Prices are correct at the time of this web page going live; however are subject to confirmation at time of booking. Additional departures are available, please speak with a rail specialist for details.